Congratulations, Texans! We made it through yet another mild, but chilly winter! This means that summer is well underway, and already, temperatures have been climbing well into the 70s! Surely, we can expect to be turning on our air conditioners sometime soon, and perhaps many of you already have. You depend on your AC all summer long to keep you and your family cool and comfortable, but what happens when something goes wrong? Every now and again, your AC is going to require repairs. 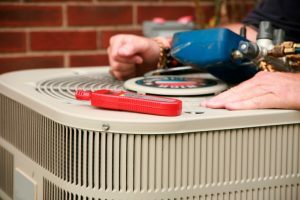 Scheduling your AC repair at the first sign of an issue is the best way to prevent further problems from developing, so it is important to be aware of some of the most common issues ACs experience over the summer. Below, we have listed just some of the issues you may notice when you turn your system on this summer. Keep reading to find out more. Your air conditioner relies on the flow of refrigerant to move heat from inside your home to outside. This summer, though, you may find that a leak has sprung in one of the refrigerant lines the liquid flows through. Without refrigerant, you will notice a lack of cooling power. Additionally, you might hear a hissing noise. If left unattended, your entire system can shut down. So, be sure to contact a professional if you notice any of the signs of a leak. Low output from your air conditioner can be the result of a number of issues. Often, you will notice warm spots around your home or notice that the system is no longer producing any cool air. If this is the case, it is important to call in a professional. Low cooling output can leave you quite uncomfortable on a hot Texas summer day. Short cycling is a term used to describe when your AC repeatedly turns on and off multiple times throughout the day without ever completing an entire cooling cycle. Not only is this extremely inefficient, but it puts a lot of strain on the system. Be sure to schedule your services ASAP if you notice this issue. Sometimes the underlying cause of an inefficient AC is leaky ductwork. In fact, a breach in the ductwork can account for up to 30% of wasted energy. Leaks make it quite difficult for your system to perform its job well, therefore, it is important to invest in the proper duct repair and sealing services. A troubled thermostat might just be the cause of your cooling problems. If your thermostat can’t register temperatures inside your home correctly for any reason, then your air conditioner will not be able to cool your home to the level you desire. A trained HVAC technician would be happy to double check the settings on your thermostat and make any necessary repairs to restore cool, conditioned air to your home. If you suspect that you are in need of air conditioning repair, be sure to contact the experts at D’Spain Sales & Service, Inc.